If you follow this blog, you’ll know that we’ve been working on a project to build a user research panel for the GOV.UK user research team. 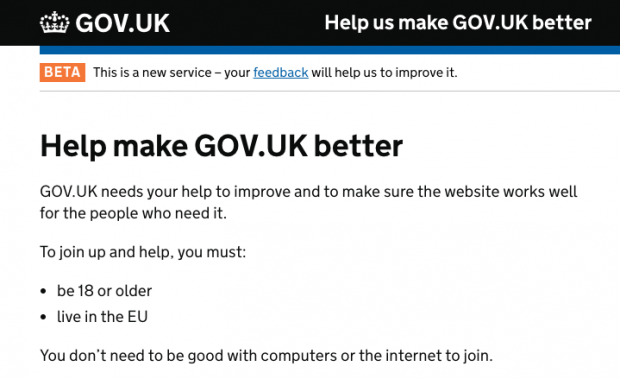 This is a list of people who have volunteered to take part in user research for GOV.UK. Earlier this year we wrote about how and why we set up this panel. We’ve got good news: we’ve passed the beta assessment, and the service is now public on GOV.UK. In this post, I’ll share a bit more about how the panel works and talk about our plans for what comes next. People who visit GOV.UK can sign up to join the panel by answering a few questions about themselves. After they have joined, user researchers can contact panellists to ask further questions and to invite them to take part in user research. The panel will never replace all of our existing recruitment as we know that people who don’t use a computer, for example, will never join. So we will also continue to use specialist recruiters and to do pop-up research. We know that we’re not the only researchers in government who want to improve how we recruit research participants. So, when we procured and contracted for the user research panel, we did it a way that would support sharing it across government. Essentially, this meant finding both suppliers and a solution flexible enough to allow it to be shared, and making sure that the procurement contract with the supplier included something formal about this intention. While we were developing the panel, we spoke to several departments and agencies who were interested in using the panel and, working with the supplier, we came up with a technical and financial plan for how it would work. As a result, we’ll soon do a pilot with two government departments to learn what works and what doesn’t and whether a cross-government platform is a viable long-term plan. If that’s all good, we’ll keep going with those departments and expand from there. If you'd like to find out more about the panel or to use it for your research, please contact katie.taylor@digital.cabinet-office.gov.uk. Follow Katie on Twitter and don't forget to sign up for email alerts. Great news I look forward to learning more as this progresses. I'd be interested to hear more about the pilot as that develops. Do you have any update to this please?